It is just me or is it hot? You know, like a simmering caldron or pot! Though it could be a villain? One who dresses like a bin-man? Plus is known to smoke an awful lot of po.... Oh! Something that is... err... NOT... consumed by either the creative team of Francis Manapul, Brian Buccellanto, Marcus To, or Publisher: DC Comics in August 2012. Allegedly -- I think. Have you ever heard of the expression "A change is as good as a cure"? Well, do you know that this expression is also b*llsh*t too? 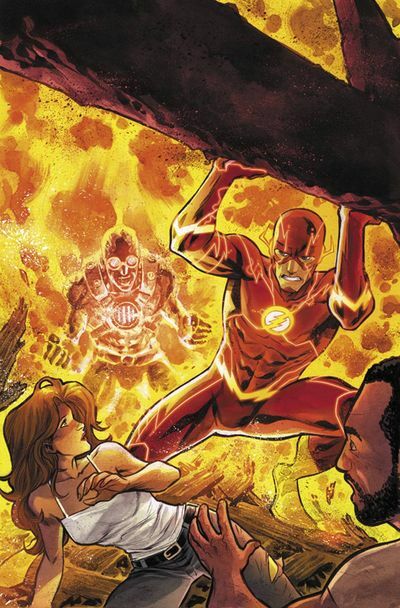 Just ask the speedy chap in this issue of the Flash entitled 'Slow Burn' if you don't believe me. Picture the scene you funny faced clown; Barry Allen thought that it would be a good idea if he'd start a new life for himself in Keystone City, because everyone 'back home' thinks he's a member of 'The Who' -- most probably dead. However, as an idea's goes, 'good' is not how I would define it. You see, while Barry is having a drink with Captain Cold at a rogues bar, Heatwave suddenly turns up and tries to flambé his old friend. Worst still, nothing is good on the television expect for Doctor Darwin Elias 'slagging off' the Flash. DAMN! To be continued just after fists fly and gliders glide. BARMAN: Hey, Daydreamer! You still owe me five bucks for that beer. No refunds. BARRY: Uhhmmm... Can I work it off? Well, a similar thing happened to me once, although I only asked for tap-water, ha! By in large I did like the very personable vibe running through this story. It's as though this is a sort of travel-log for Barry, and he is trying to start off a new adventure by doing something he does not normally do. My one small miniscule gripe with this yarn is that Doctor Darwin Elias is obviously becoming a new Flash foil. In fact, it's so obvious; I'm unsure why a cleaver chap like Barry has not picked up on this. Well, Darwin is giving him a bad-rep in the press, he's lied to him about the nature of the speed force, and he has that villains smile too. Come on Barry -- pull your finger out. STORY: I got a right kick out of reading the scene at the bar between Barry and Captain Cold. Its one of those scene's that kept me on the edge of my seat through-out, wondering how things would unravel. Shame about the interruption, huh? Still, time will tell where this is all heading. ART: As much as I don't mind Marcus To's artwork on this book, it pains me to say that I am missing Francis Manapul's stuff as well. Don't get me wrong now, Marcus is good in that clean manga style of his. It's just that his layouts are too similar to Manapul's for my own comfort -- imitative, not 'his own'. HEATWAVE: Doesn't Carmine Giovinazzo from 'CSI: New York' look like the type of a man who'd burn down your house? Just look into his eyes and you can see he has the will. Thank God he doesn't know how to use a lighter! Phew! CAPTAIN COLD: If you gaze past the silly looking hat, you will find that musician come actor, Luke Goss, has the heart of pure rubber. OK, not ice exactly. But near enough, huh? Who Will Win In A Battle Of Fire And Ice? The Captain Or The Wave? Or Would It's Just Be A Load Of Old Wind? Bruppt!!!! Can You Smell Eggs? OK, so this was a story about a fresh beginning mixed with two juxtaposing elements, correct? So to me it sounds a lot like Ammii Stewartt's 'Knock On Wood '!!!. So far this series has taken us Flash fans on a right merry go round of ups and downs. Now some of this I really do like -- as it illustrates the adventurous aspects of this title. While some of this I am not too fond of -- because stably and a 'cast of regulars' does aide a book at times. Please slow things down a bit Brian and Francis, because originality can derive from stalwarts. Take a look at Batman for example, and you see what I mean.